The countries that supply the most immigrants to each US state IN 2015, Bank of America Merrill Lynch (BAML) created a map based on data from the Department of Homeland Security showing the countries that supply the most immigrants to each US state when Mexico is excluded from the count. 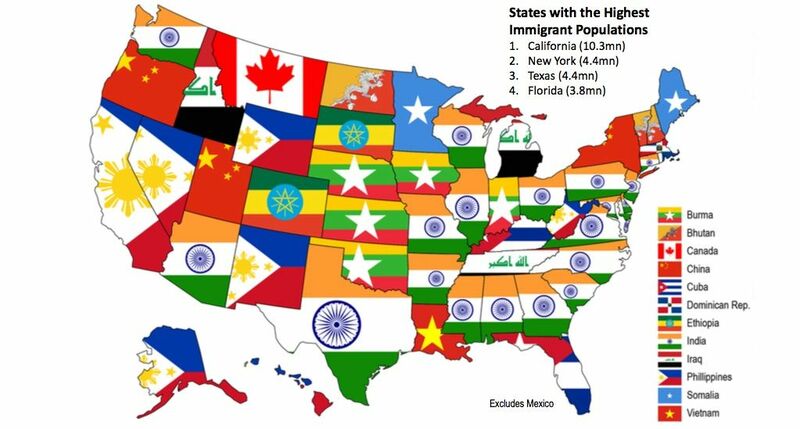 IN 2015, Bank of America Merrill Lynch (BAML) created a map based on data from the Department of Homeland Security showing the countries that supply the most immigrants to each US state when Mexico is excluded from the count. Some results are surprising; Canadians are the largest immigration population in Montana and Vietnamese people are the largest immigration population in Louisiana.